California cities suing Exxon and four other oil companies have reworded a portion of their original complaint after being rebuked by the presiding judge. The cities of Oakland and San Francisco are arguing that Exxon knew of the effects of climate change caused by the burning of fossil fuels decades ago, but carried on with business as usual and ignored the possibility of environmental harm while covering up their knowledge of potential dangers. The cities had initially pointed to a 1996 internal memo from an industry group, the Global Climate Coalition (funded by the America Petroleum Institute), which said that, "a doubling of carbon dioxide levels over pre-industrial concentrations would occur by 2100 and cause ‘an average rate of warming [that] would probably be greater than any seen in the past 10,000 years.'" However, the memo was referencing an assessment by the United Nations Intergovernmental Panel on Climate Change, and was not the independent findings of the GCC's work. If the GCC had reached this determination on their own, the memo had a higher likelihood of showing that those in the oil industry knew of potential harms from climate change because they were relying on their own independent research and conclusions. U.S. District Judge William Alsup said the IPCC's conclusions were widely known, and therefore, "it's hard to say [Exxon and the other companies] were secretly aware" of impending environmental harm. Alsup said in a hearing last week the wording of the allegation in the original complaint implied "there was a conspiratorial document within the defendants about how they knew good and well that global warming was right around the corner," according to Legal NewsLine. "And I said, ‘Okay, that’s going to be a big thing. I want to see it,'" Alsup continued. "Well it turned out it wasn't quite that. What it was was a slide show that somebody had gone to the IPCC and was reporting on what the IPCC had reported, and that was it. Nothing more." The cities bringing the suit are alleging the oil companies have created a public nuisance and are asking the court to order them to create an "abatement fund remedy" to pay for infrastructure upgrades to deal with rising sea levels. Officials and attorneys for both Oakland and San Francisco did not respond to a request for comment on the new filing. 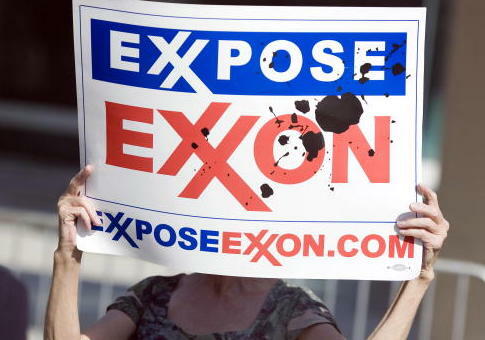 The allegations that the five major oil companies had foreknowledge of serious environmental harm decades ago but covered it up has become a significant argument for environmentalists, largely promoted under the slogan and Twitter hashtag #ExxonKnew. Proponents of the campaign have compared the actions of the oil companies to those of tobacco companies in the 1950's and 60's, when they began to learn of the harmful effects of cigarette smoking, yet continued to market and sell their products. "The parallels between what the tobacco industry did and what the fossil fuel industry is doing now are striking," Sen. Sheldon Whitehouse (D., R.I.) wrote in a 2015 op-ed in the Washington Post. "In the case of fossil fuels, just as with tobacco, the industry joined together in a common enterprise and coordinated strategy." The senator seemed to soften his stance slightly in the op-ed's conclusion. "To be clear: I don't know whether the fossil fuel industry and its allies engaged in the same kind of racketeering activity as the tobacco industry," he wrote. "We don't have enough information to make that conclusion. Perhaps it's all smoke and no fire. But there's an awful lot of smoke." The new court filing from Oakland and San Francisco is not just about revising the wording regarding the IPCC report. The cities have also included "scientific evidence bolstering claims based on the threat of rising sea levels, including satellite data supporting long-term sea level rise despite short-term changes driven by El Nino," according to Legal NewsLine. However, the new allegations of threats of damage to the coastal cities because of rising sea levels could be problematic in their own way. The Competitive Enterprise Institute has asked the Securities and Exchange Commission to investigate the same cities for securities fraud because, in the prospectuses for municipal bonds, they downplayed the future harm caused by any rise in global temperatures. "Investors across the country have relied upon the statements by these municipalities in choosing to invest in their bonds. They deserve accurate information as to the potential risks of their investments," CEI wrote in a letter to the SEC's Public Finance Abuse Unit in early February. Judge Alsup will consider a motion to dismiss the public nuisance suit against Exxon and the other companies in late May.